funny-side-of-life.blogspot.com - A funny take (with a cartoon) on the gadgets we have and its reflection on our personality. zindagiunlimited.blogspot.com - Do you like Apple or Blackberry?? I am not talking about those life gagging gadgets, silly!!! ink-and-feathers.blogspot.in - Nothing inspires the caterpillar to turn into a butterfly but itself.The best change is from within,change is easy only if you make it. kamathsparadise.com - This blog post is submitted for "Change is easy. " contest. I feel, by using right kind of gadgets one can perform better in all walks of his life. 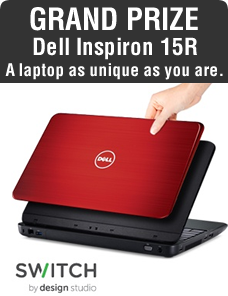 Blog and win a cool Dell Inspiron laptop! Do your gadgets reflect your personality in any way? Tell us how and win an awesome, top-of-the-line Dell Inspiron Laptop with a customizable cover that represents who you are!